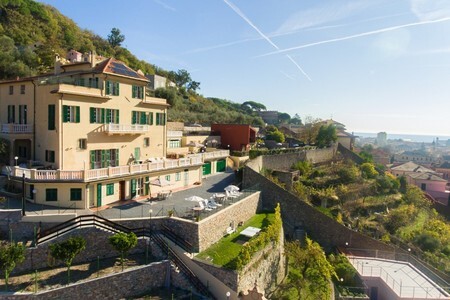 Embrace a timeless holiday on the tranquil Ligurian hills, from this villa apartment with on-site pool! 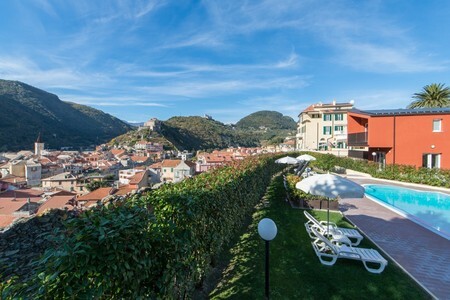 Perfectly placed for reaching the village highlights and tourist attractions of Finale Ligure, this modernised villa apartment with pool access offers an enduring setting for exclusive holiday stays. Inside, the air-conditioned Living room provides a tranquil setting in which to kick back and relax, with a modern sofa and TV to hand. 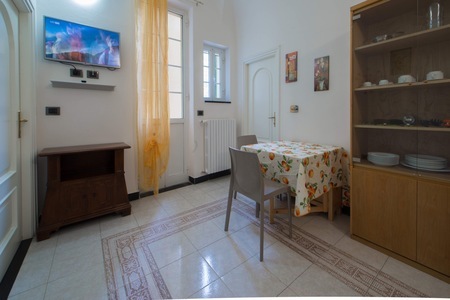 The spacious room also features a stylish dining table for 4 and a beautiful original mosaic floor. Next to the Living room, an adjoining Kitchen provides a unique setting in which to prepare a family feast. 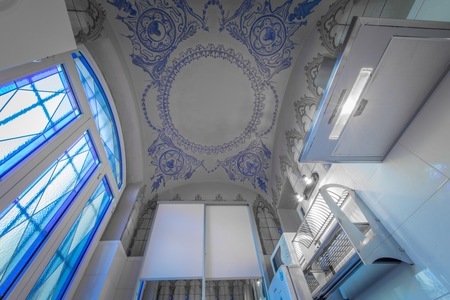 Its high ceiling and walls features beautifully restored original frescoes. The graceful design provides a timeless and intriguing ambience in which to use the cooker hob, microwave, oven and fridge freezer. 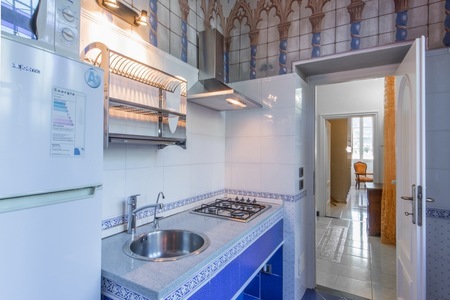 Groups of 4 are easily accommodated within this spacious villa apartment. A well-presented Master bedroom features a Double bed and Single bed and invites guests to enjoy its far-reaching country views, from its romantic Juliette balcony. A Double sofa bed in the Living room offers welcome flexibility. 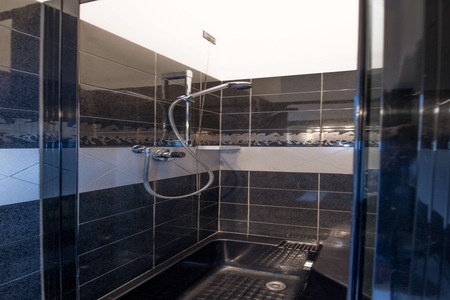 The flexible accommodation is complemented by a retro fitted family bathroom with bath tub, shower tap, basin, WC and bidet, alongside a modern shower room with basin, WC and bidet. 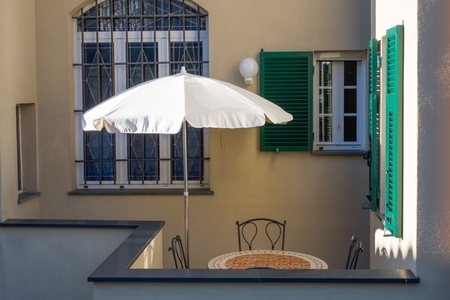 Outside, a lovely spacious private balcony sets the scene for unhurried lunches and evening dinner parties. The dining set for 4 is complemented too by a parasol. 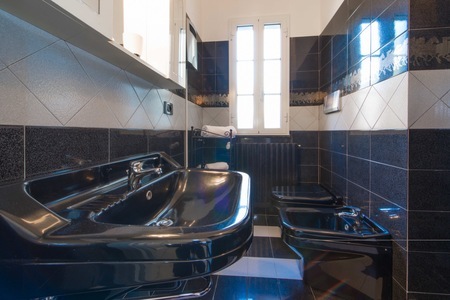 Within the luxury villa residence, guests will find a communal outdoor swimming pool, a bike storage room and a set of road and mountain bikes, for their enjoyment during their stay. Guests will also conveniently find an on-site private parking space. The modernised villa residence is conveniently placed a few meters away from a selection of shops, a supermarket, a bakery and pharmacy. The lakeside centre is within a 7 minutes’ drive away. 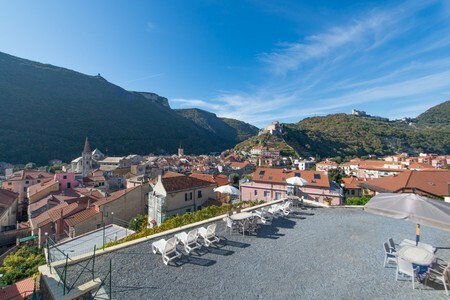 Key Features • Unique apartment in a 17th century villa residence • Scenic hillside location of Finalborgo • Free WiFi access + SAT TV • Air-conditioning • Sunny private balcony • Alfresco dining set with parasol • Lovely outdoor pool (shared by 15 apartments in all) • Private parking space • Communal table tennis & bikes available for guests’ use • Bike storage also available • Walking distance from shops, supermarkets, restaurants & amenities • Car essential Sleeping- Bedroom 1: A tranquil room featuring a Double bed, Single bed, wardrobe and scenic Juliette balcony Extra: A Double sofa bed also features within the Living room Bathrooms- Bathroom 1: A retro suite fitted with a bath tub, shower tap, wash basin, WC & bidet Bathroom 2: A modern shower room with wash basin & WC Additional- • 1 internal and 12 external steps • Hairdryer • Washer Dryer • Clothes horse • The communal swimming pool is open from 15th June – 15th September • Pool is shared by 15 apartments • Communal sun loungers provided • Can be rented alongside other available Residenza sul Borgo apartments Location- Situated along ‘Via Oddone Pascale,’ the renovated villa residence provides a lovely restful and scenic setting on the sunny Alassio hillside. A range of local eateries and a pastry shop can be reached within 2 minutes on foot, whilst the town’s central train station and resort amenities are 7-minute drive away (a car is recommended). 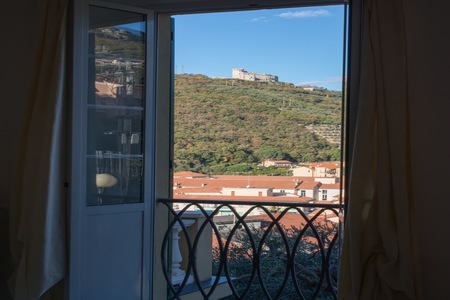 The amenities on offer in the coastal resort of Finale Ligure are complemented by the popular Vittoria Beach and the pool lido of Piazza Vittorio Emanuele II. 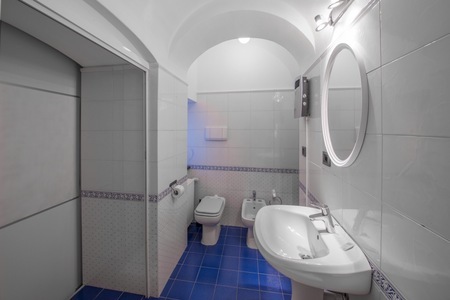 Local resort highlights well-worth exploring include the Palazzo del Tribunale, the Museo Archeologico del Finale, Porta Testa and the Fortezza di Castelfranco. 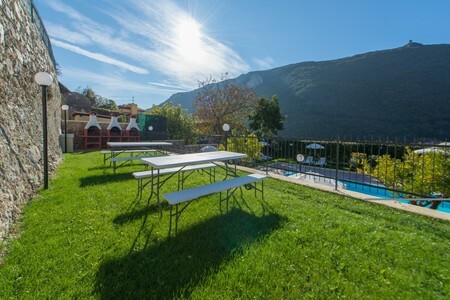 Nearby, the buzzing night life, gastronomy festivals and theatre shows’ of Ceriale can be enjoyed (26 minutes’ drive away). The ancient city is also home to a plethora of historical visitor monuments, churches and palaces. 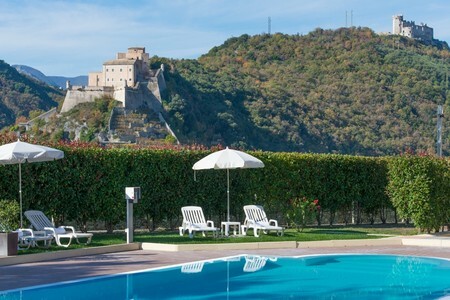 Guests are well-placed for soaking up the nearby Le Cravelle Aquatic Park, the Garlenda Golf course and the nearby excursions to Castello di Zuccarello and Silvio Lai Paleoethology museum (approximately 30-35 minutes’ drive away). A wealth of coastal and inland leisure pursuits can be enjoyed along the coast, including beach volleyball, sailing, canoeing, surfing, kitesurfing, windsurfing and diving, to horse riding, tennis, golf, basketball, horse racing at the Hippodrome dei Fiore Spa and exploring the surrounding regional nature reserve of Rio Torsero and coastal nature reserve of Isola Gallinara (perfect for sailing). For those flying in, the complex offers proximity to the airports of Villanova d’Albenga Airport (31 minutes’ drive) and Cristoforo Colombo Airport in Genoa (51 minutes’ drive away). The Cote D’Azur airport in Nice is 1 hrs’ 40-minutes’ drive away. Those looking to fly into Cuneo International Airport are within 1hr 25 minutes’ drive away.